How much force is exerted on one side of an 8.50 cm by 11.0 cm sheet of paper by the atmosphere? How can the paper withstand such a force? The same force is exerted on the other side of the paper, which balances the force on this side. There is no net force. This is College Physics Answers with Shaun Dychko. This question asks us to find the force exerted by the air on a sheet of paper that’s eight and a half by 11 centimeters. So the pressure of the air is the force that it exerts divided by the area that its exerting the pressure on. And we’ll solve this for F by multiplying both sides by A, so the force is the pressure times the area. So that’s pressure times length times width, this is a piece of paper, eight and a half by 11, I think the question may have intended to use units of inches, because that’s the standard sheet of paper in America, but it wrote centimeters and so we’ll use centimeters in our question here. So centimeters is the prefix meaning multiply by ten to the minus two, so we have 1.01 times ten to the five Newtons per squared meter times eight and a half times ten to the minus two meters times 11 times ten to the minus two meters, this gives 944 Newtons. 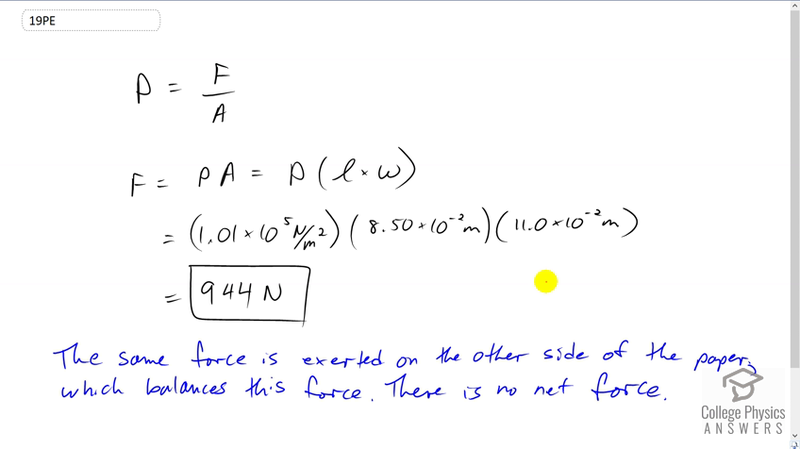 Which is a lot of force but we don’t notice anything, we don’t notice the paper accelerating because this is not a net force, because on the other side of the sheet of paper, there is an equal force being exerted on the opposite direction, so these forces are balanced so there’s no net force.